"There will never be another Sinatra"
Frank Sinatra autograph Collection you will ever find! SIGNED CONTRACT for "High Society". NOTE: Be very cautious with Sinatra autographs as the majority are secretarial or forgery. We always look for In-Person and Unquestionably Authentic signed items such signed legal documents as he NEVER signed authentically through the mail. Even friends who requested a signed photo would usually get a secretarial one sent to them. I have seen baseballs that were sent to his room and came back with his name on it which was actually a very BAD signature by one of his bodyguards or friends..One thing to keep in mind is that Sinatra's "real" signature is somewhat sloppy and NOT nearly at neat as the secretarial's out there. I have been collecting for over 20 years, in particular Sinatra. I have several signature studies on him and have spent a great deal of time analyzing and tracking his "authentic" and "fake" autographs. Sinatra's signature is particularly tough to authenticate because his signature varied greatly throughout each decade since the early 40's. His signature went from a flamboyant style in the 40's and 50's to a somewhat hurried and sloppy signature in the 90's. In particular, I estimate 99% of the Sinatra signatures from on-line auctions, such as e-bay, are NOT authentic. 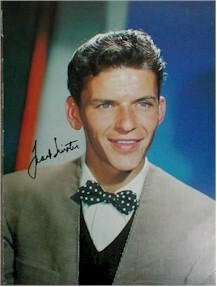 For example, I recently did a search on an on-line auction and pulled up 73 Sinatra signed items. Only ONE was consistent with my signature studies, whereas most of the others were blatantly secretarial or fake. What makes this more outrageous is that many are backed by so-called "forensic experts". Hence, be very cautious as you could end up spending $100's for a worthless item. And, also be cautious of COA's as they are worthless unless they hold a money back guarantee. IN ADDITION, look at the sellers feedback, does he hide it, how many negatives AND is he selling the "same" autographs every week? I know of one ebay seller from MA who posts high end autographs, like Judy Garland and Sinatra about every week. He signs them the same way on the same kind of paper with his trademark forgery. He has over 10000 positives because inexperienced buyers don't even realize they are buying a WORTHLESS FORGERY. So, when you see a $400 autograph' like Garland selling for $50, that is indeed a BIG "red flag". Don't you think the many autograph experts would be bidding on it?? When I bid on a Sinatra autograph, it is usually selling for several hundred $$. Last week an AUTHENTIC Sinatra/Dean Martin signed Sands Hotel napkin sold for $1100...Why? Because those who truly know his signature were bidding "true value" for it. This is not ONLY with Frank Sinatra but ALL the more valuable autographs on eBay. And, the forgers are getting more and more deceptive, as some now even post HIGH reserves to counter suspicion.. There is one skilled forger who adds sketches to his high-end forgeries and does his work on old paper, old photos and other material that makes the autograph appear to have appropriate age. It seems to work as I have seen him watched him HIGH-END forgeries for the past 3-4 years. I recently witnessed him sell a forged Beatles for $3500. How painful it will be when the buyer eventually has it authenticated. ..We back all our autographs with 20+ Years of experience, very strong ethics and a LIFETIME MONEY BACK GUARANTEE. Lastly, don't be discouraged by these "tricky" sellers as there are many honest, reputable dealers out there. A true, authentic autograph photo of someone the stature of Frank Sinatra is a priceless treasure that will DEFINITELY be enjoyed for a lifetime!! Frank Sinatra - Vintage signed photo with historical documentation. MUST SEE!! RARE SIGNED Concert Program - Nice personal Inscription and adds a DRAWING!! Sinatra - Another incredible in-person signed, autograph item. Signed Sinatra Tennis Tournament program. Comes with letter of provenance...Must see. Sinatra - Beautiful EXTRAORDINARY Vintage signature on USO letterhead, signed in 1958. RARE "Sinatra" Signed Menu - Incredible and very unique Sinatra SIGNED benefit menu, Must see!! SIGNED CONTRACT! 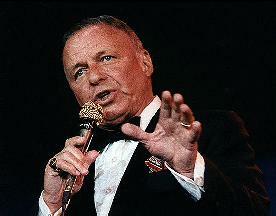 - Sinatra signed contract with Capital Records. Hollywood history!! JUST ARRIVED- CONTRACT - Historical SIGNED contract from 1957. MUST SEE! Frank Sinatra and Jilly Rizzo - BOTH signed this vintage photo - with long inscriptions! "Rat Pack" - Genuine vintage autographs - Frank - Sammy - Dean! RARE VINTAGE Autograph Album book - Frank , Sammy and others, MUST SEE!! Autograph Collection - 1940, Sinatra, Chico Marx, Frankie Lane, Ink Spots, others, MUST SEE! "High Society" - 1956 - Frank, Bing, Grace, Louie!! Stunning Title Card and lobby card and insert! MUST SEE!